Born in Jhelum, Pakistan. Lives and works in New Delhi. 1939-44 Studied at Mayo School of Arts, Lahore. 1944-47 Diploma in Fine Arts, J.J. School of Art, Bombay. 1952-54 Palacio Nationale de Belles Artes, Mexico. Student of D.A. Sequeiros in mural techniques, Mexico. 1952 Solo exhb., organised by Delhi Silpi Chakra, Dhoomimal Art Gallery, New Delhi. 1953 Solo exhb. in Mexico City. 1955 Solo exhb. in New York. 1956 Solo exhb. in London, Bombay and New Delhi. 1956 Despair, National Exhb., Lalit Kala Akademi, New Delhi. 1957 The Condemned, National Exhb., Lalit Kala Akademi, New Delhi. 1960 Group exhb. with six artists: M.F. Hussain, Mohan Samant, V.S. Gaitonde, Ram Kumar, K.S. Kulkarni, Krishen Khanna. 1961 Solo exhb., New York. 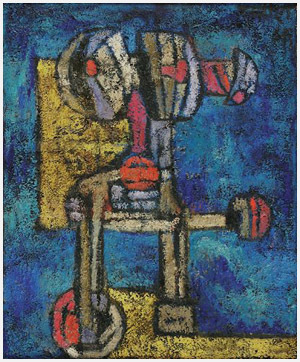 1961 Solo exhb., Asoka Gallery, Calcutta. 1961 Travelling exhb., Cairo, Mexico, Rome, Frankfurt, Paris, London, Montreal, Hawaii and Tokyo. 1964 Solo exhb. in New Delhi. 1964 Solo exhb., Forum Gallery, New York. 1966 Solo exhb., Paper Collages, New Delhi. 1967 Solo exhb., Paper Collages, Bombay. 1968 Paper Collages, New York, Finland, Sweden, Madrid, USSR, Mexico, Peru, Argentina and Brazil. 1969 Solo exhb., Metal Sculptures, New Delhi. 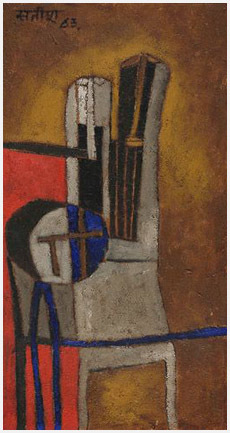 1956, 57 National Award for painting, Lalit Kala Akademi, New Delhi. 1974 National Award for sculpture, Lalit Kala Akademi, New Delhi. 1977 Punjab Govt. State Honour. 1983 Delhi Government State Honour. 1984 Belgiums, Order of the Crown, for Architecture. 1989 Delhi Citizen Council Honour, New Delhi. Received Mexicos Da Vinci Award for lifetime achievement. 1996 Honorary Doctorate Vishakapatnam University. 1998 Padma Vibhushan, Govt. of India. 2000 Honorary Doctorate, Visva Bharati, Santiniketan.